Januaries are a stacked month when it comes to famous author's birthdays. I remembered Tolkien, Howard and Smith, but I completely forgot Asimov, Poe, London and Merritt's birthdays, C.L. Moore's centennial, and I've just discovered I barely missed Lloyd Alexander's, which was yesterday. I also missed the anniversary of Rudyard Kipling's death, and Walter M. Miller's birthday and death. Well, no more: I'm setting a calender for important dates to ensure this doesn't happen again. Even if it's a simple line or picture, I refuse to let my favourite authors' days of celebration and remembrance go unnoticed any longer. 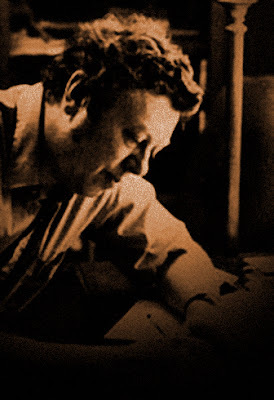 And, just to prove this rule, I'm going to celebrate an author I don't think I've ever actually talked about on the blog: Gordon R. Dickson, who died ten years ago today. Gordon R. Dickson is most famous for two series, the Childe Cycle, and the Dragon Knight saga. I haven't had the pleasure of reading the former, but I have read the first two books of the latter: The Dragon and the George, and The Dragon Knight. The Dragon and the George is, upon the surface, an Oz pastiche - a man from modern times is transported to a pre-modern fantasy world filled with mysteries, monsters and magic akin to your usual common-or-garden medievalist fantasy. In this case, our hero is Jim Eckert, who has leapt into the world to rescue his fiancée Angie, who has been kidnapped by the nebulous "Dark Powers." However, there's a twist in the tail (ho ho) - Peter's mind is transported into the body of a dragon. Thus, the story is told from the point of view of a creature which often serves as an antagonist or obstacle for the heroes to overcome, in a similar vein as John Gardner's Grendel, though not taking a specific story. Normally I don't have a lot of time for comic fantasy. Too often it seems mean-spirited, or shallow parodies of the same tropes and cliches that have been done to death. Yet there are indeed some gems to be found: Terry Pratchett is the most famous modern practitioner, even if I have to go against popular opinion and say his early work is superior to his modern work. Dickson's work differs from Pratchett in that it doesn't go for the unsubtle allusions to popular culture: however, it is similar to Pratchett in that it has a strong, warm heart beating underneath the comedy. Even when there are hilarious lines and amusing situations, whenever the mood changes, it feels real. The danger is authentic, the sadness true, the warmth genuine. So few works of comic fantasy retain this vital spark: Pratchett - and Dickson - do. 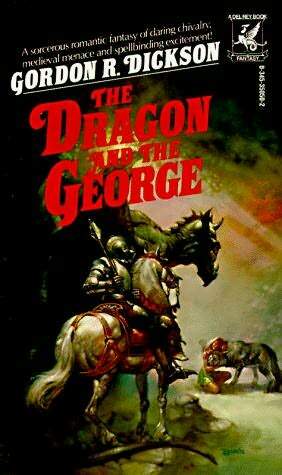 While I heartily recommend The Dragon and the George, I also suggest reading its earlier short story iteration, "St Dragon and the George." Generally speaking, I find I prefer short fiction over novels. My credo is "if a story can be said in a short form, it should be told in short form": the only stories that require novel length are those stories which cannot be told in the form of a novella or short story. As such, I found I actually enjoyed "St Dragon and the George" far more than the novel: it moves at a lively, brisk pace, and leaves one wanting more in a way the book doesn't. It can be read online here: since it was written first, I think it's well worth reading it, and if you enjoy it, give the novel a go. The Dragon and the George was adapted - sort of - into the Rankin-Bass animated film The Flight of Dragons. What's intriguing about this is that while it takes the basic plot structure of a the film, and many of the characters, the film is infused with the speculative biology of Peter Dickinson's The Flight of Dragons - explaining tropes seen in dragon mythology from a biological point of view. Hence, the dragons' power of flight is explained as utilizing a system of gas bladders filled with hydrogen, with the famous dragon's fire being a byproduct of hydrogen buildup. I saw this as a lad, and it spoiled me for a lot of animated films that didn't even attempt its scientific depth. I credit this film, as well as the speculative biology books of Dougal Dixon, with my interest in the scientific aspect of fantasy. 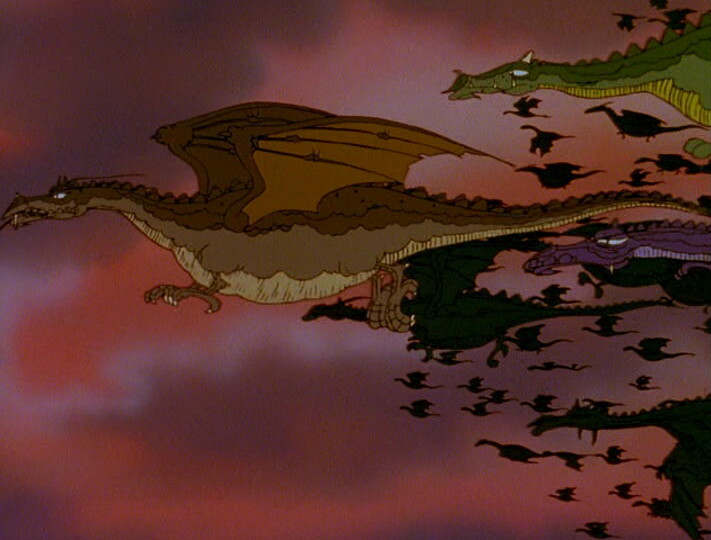 Like most Rankin-Bass features, The Flight of Dragons suffers from the peculiarly stunted animation of the studio, as well as some bizarre clashes of art design. 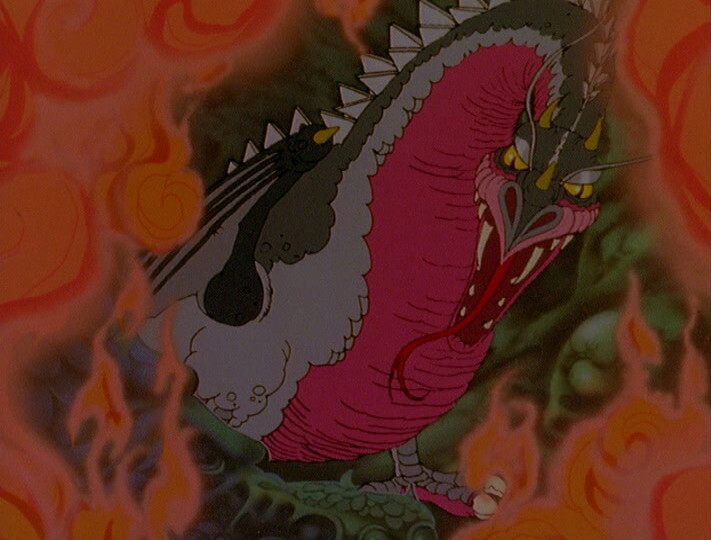 The humans have a realistic, almost manga-esque simplicity of form, while the dragons resemble the beasts of Norse art (and if there's any justice, the upcoming Hobbit's Smaug would look like this film's conception of dragons rather than the bizarre wolf-thing of Rankin-Bass's own Hobbit), and other creatures resemble nothing so much as goofy cartoon monsters. The Worm of Sligup was particularly dreadfully designed. However, I find the strengths of the film far outweigh the weaknesses. The film has less of the comic energy of the stories, but replaces it with a thoughtful, almost scientific pace, the sort a precocious miniature palaeontologist like myself relishes. Nonetheless, there is some comedy, mostly in the form of James Gregory's crotchety Smyrgol and Larry Stotch's fantastic Sir Orrin Neville-Smyth, and in the main character's clumsy attempts to find his dragon-legs. However, it's in the sense of wonder and imagination, especially when it clashes with the main character's scientific rationalist mindest, that is the real charm of the film. The film's climax is one of the cleverest I've ever seen in a kid's film. 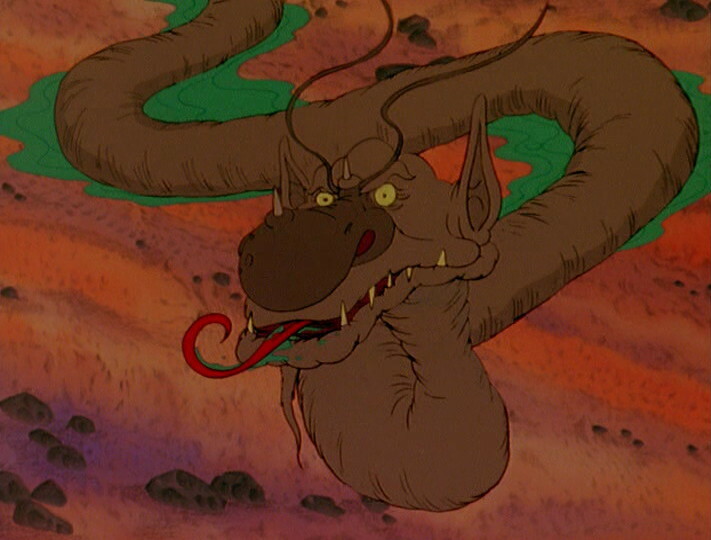 Did I mention the Big Evil, Omadon, was voiced by James Earl Freakin' Jones? And Bryagh... well, Weta have a hell of a time ahead of them if they want to make Smaug even halfway as intimidating and cunningly sadistic as this beast. This is a movie with a dragon voiced by James Gregory, a heroic knight that sounds like John Cleese, and an evil wizard voiced by James Earl Jones. This movie is awesome. Overall, while The Flight of Dragons isn't a faithful adaptation of the stories, it retains the characters, basic plot and philosophy of the book, as well as adding a little something extra which puts it in a new light. The voice acting is great, the animation great by Rankin-Bass standards, and the science is accessible enough for children while still being compelling enough for adults. 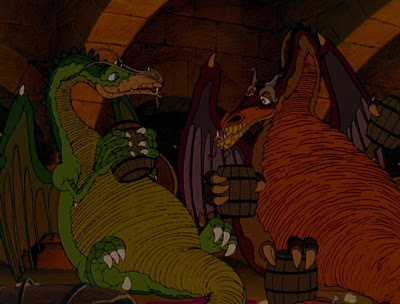 Plus, it's the only film I can think of where two dragons get drunk on mead and start singing Stephen Foster songs. I don't know what Dickson thought of the film: whether he loved or hated it, or simply respected it as its own entity. I'd like to think he appreciated it for attempting to be something more than a run-of-the-mill children's film that looks at things from the dragon's point of view. After all, that's what made The Dragon & the George so great. We need more stories from the dragon's perspective.